34 inches (86 cm) tall and 28 inches (71 cm) circumference. The bud has grown 2 higher and 1 in circumference from yesterday. The tip of the spadix continues to extend and should rise above the spathe tomorrow. The protective sheaths are showing some wrinkling as the bud continues to increase in girth. The pollination of the titan arum is an extraordinary process. The pollination begins by emitting its putrid stench. The inflorescence emits its odor to lure in pollinators like carrion beetles and flies who like to lay their eggs in rotting flesh. The insects are attracted to the flower and enter into the area enclosed by the spathe (the purple petal-like structure around the base). The insects walk around looking for a carcass and pass over the female flowers in the process. That night the spathe will close up, trapping insects inside the structure. At that point the female flowers cease to receive pollen and the male flowers kick in and release the pollen. This prevents the inflorescence from pollinating itself. As the pollen sheds, the trapped insects get thoroughly covered. The spathe then slightly opens allowing the insects to escape. With any luck they will find their way to another titan inflorescence where the pollen can be deposited on the female flowers and thus pollination has occurred. Last year we received pollen from the Stephen F. Austin State University Mast Arboretum and attempted pollination. The pollination was successful; however, the seeds did not make it to maturity as we lost the plant to rot. The tuber on a titan arum is very sensitive to a number of pathogens and in this case the rot had advanced throughout 70% of the tuber by the time it was detected it was too late. Weve decided to not pollinate this plant this year. Carrying seeds through to fruition takes a lot of energy out of the tuber and we want to preserve as much of the tubers energy as we can for future growth. 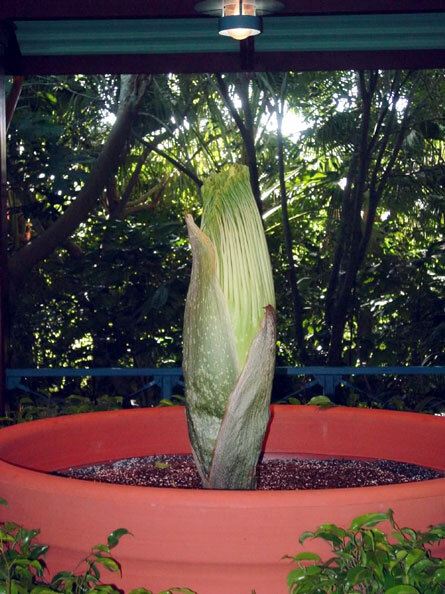 DID YOU KNOW: When the flower opens, the tip of the spadix heats up. This helps give the heavy, sulfur-based odors the kinetic energy needed to go air-born and travel long distances to attract pollinators. The spadix will heat up to the temperature of a human being. Check out the thermal images from the University of Wisconsin.